One of the most expensive things for a student to acquire is a proper furo and kama. Students of Issoan Tea School have a marvelous opportunity to win one. I was recently given an electric furo and kama by a fellow student at my calligraphy class. It had been neglected and sat around for many years. She was going to throw it out, but I said that I would take it and see what I could do about it. It was very ugly when I got it. 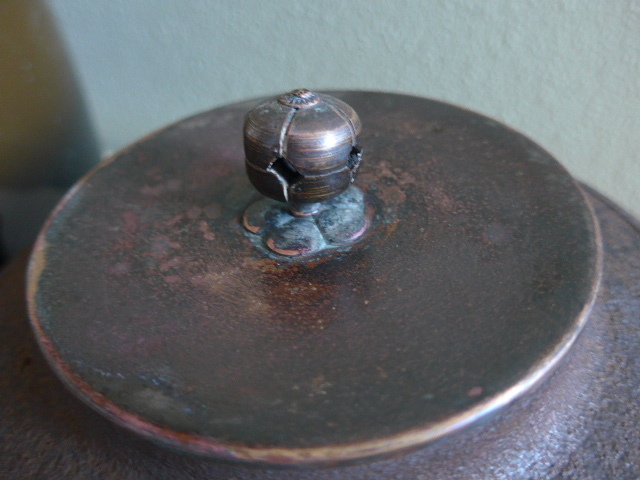 The outside of the kama was very rusty, the lid was rough with green oxidation. 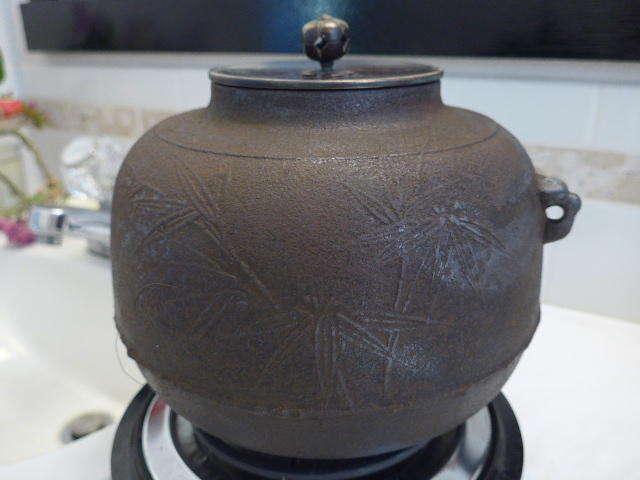 The kan were rusted in the kantsuki. The furo had these growths on the outside that looked like mold and salt crystals.The inside of the furo was flaking off. 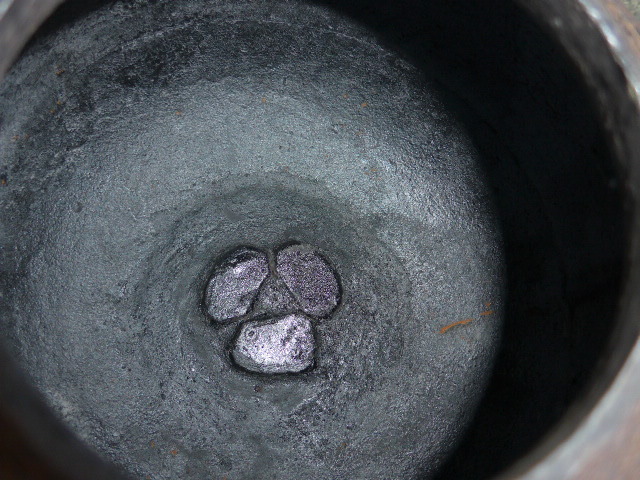 But the electric element worked fine, and miraculously the inside of the kama looked fine. I wish I had taken before photos. 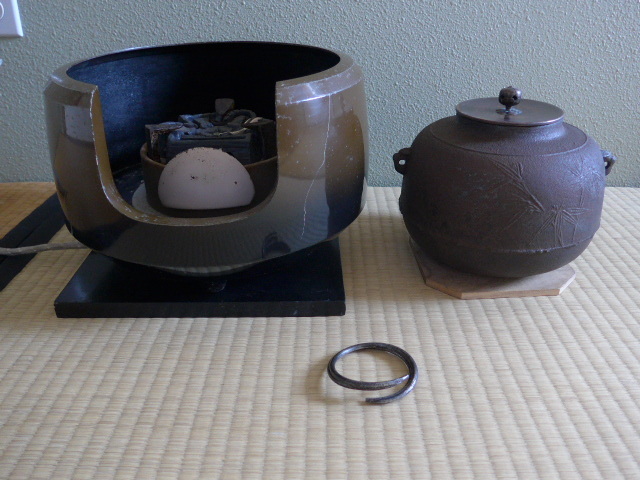 For the students of Issoan Tea School, there is a contest, and some lucky winner will have this furo and kama to take home. I will also provide the shiki ita board that goes under the furo. Please check your email for the contest rules, deadlines and judging. Gambatte everyone! Yes, good luck to everyone. How cool! Good luck everyone! It turned out very nice considering how ugly it looked when I got it. Some student will be very lucky indeed.